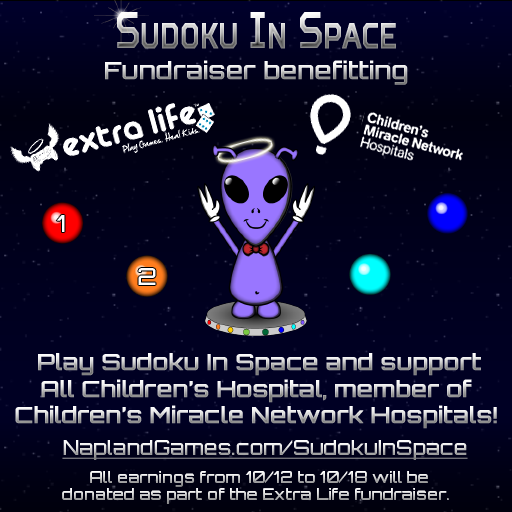 This week, Napland games (creators of Wordspionage) has been holding an Extra Life fundraiser within their new game, Sudoku in Space. You can look for a review of the game next week, but in the meantime, all earnings from Sudoku In Space during the rest of this week will be donated to benefit Children’s Miracle Network Hospitals as part of the Extra Life fundraiser. It’s a good time to check it out! You can download it for 99c on the official site and for free on the App Store and Google Play.